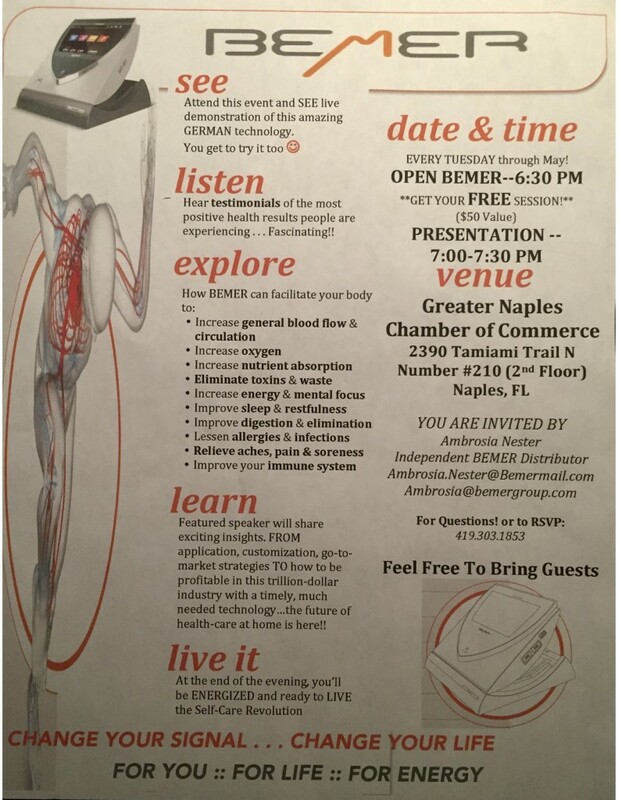 Come and learn about BEMER Therapy! I am new to the group so I wanted to invite you to learn about what I do! Here is some information on BEMER/PEMF Therapy. Here, Doctor OZ explains this therapy. Bemer is the best device on the market for this – has been used in Germany for the past 18 years and has formed a partnership with NASA. Bemer is especially known for dramatically increasing circulation and with doing this, delivers oxygen to each and every one of your cells, delivers them the nutrients they need and helps them to detoxify. This in tern promotes self healing for what ever is ailing the body. The Bemer is doing wonders for people all around the world with chronic pain, diabetes, insomnia, low energy, low testosterone, mental clarity and weight loss — to name a few. Here is a video for the blood flow before and after an 8 minute session! I will be helping to host an informative meeting that will be taking place every Tuesday through May at the Greater Naples Chamber of Commerce! We will open the doors at 6:30 to allow for FREE Bemer sessions ($50 value)! We will begin the presentation at 7:00. Would be great if you could make it! Feel free to pass on the information about the meeting – the more people to learn of this technology the better! I am so excited to share this device with you all!